Metro Nashville Public Schools steered $1.8 million in no-bid contracts to a company with whom Director of Schools Dr. Shawn Joseph had done business in the past, violating state purchasing laws, a NewsChannel 5 investigation has discovered. Joseph, who took control over the Nashville school system in July 2016, had appeared in a slickly produced video that touted how Performance Matters' student assessment software had been utilized in his previous job in Prince George's County, Maryland. A complimentary quote from Joseph was included in the company's promotions. He had even been the keynote speaker at a Performance Matters conference in 2014. 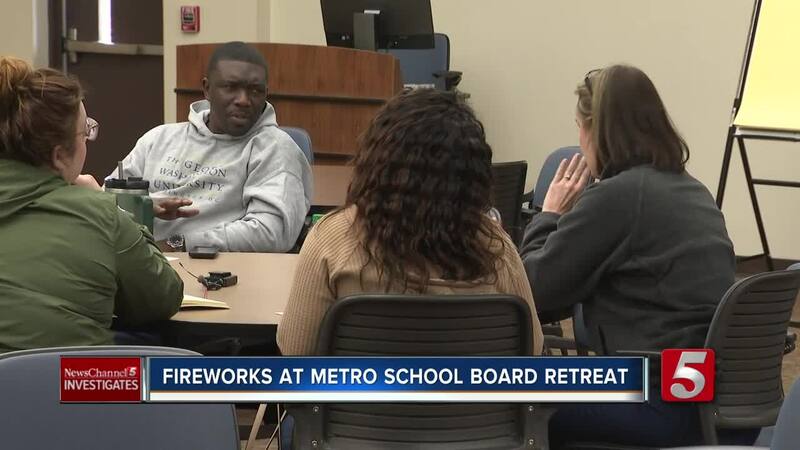 But, just six weeks after starting as the director of Metro Schools, Joseph's calendar shows he was hosting Performance Matters salesman Roderick “Rocky” Sams in the district offices. "Dr. Joseph wants to pilot Performance Matters in the Priority Schools," Felder said in an email, referring to the district's lowest performing schools. "Multiple employees were coming to me with serious concerns about Performance Matters," Frogge said. "They said that both the salesman and the project manager for Performance Matters told them, 'You are going to get these products.'" We asked, "Whether you want them or not?" "Right," Frogge replied. "And there were conversations along the lines, you know, we've got Dr. Joseph on speed dial. If you don't do this, we'll call your boss -- that kind of thing." Internal emails show that veteran employees were not sure what Performance Matters' Unify platform could do that the school system's own “data warehouse” did not already do. 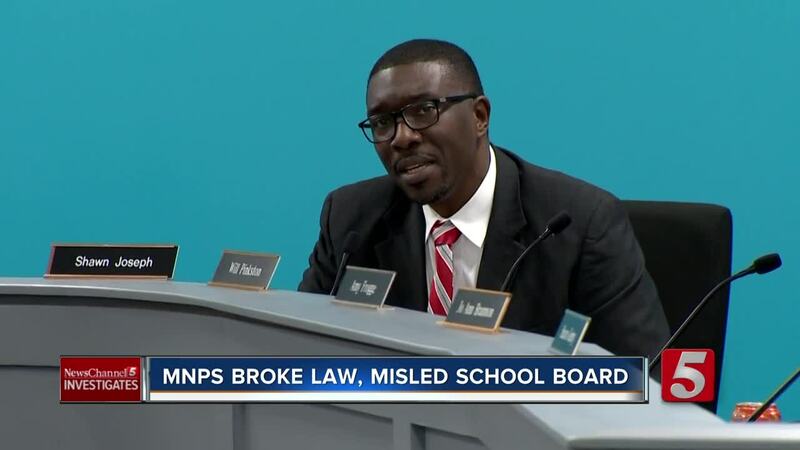 In fact, the emails reveal frustrations that Joseph and his team had seemingly not taken the time to learn what MNPS' existing system could do before they turned to Performance Matters. "No one here really knows what the intent [is] for this," wrote Dr. Tina Stenson, the district's director of research and evaluation. Toni Russell, then the executive director of technology and information resources, was trying to figure out "what problem are we trying to solve?" "My first impression of what I saw with Performance Matters was it was simply a way of presenting data in the DW [data warehouse] pretty," Russell continued. Dr. David Williams, then the interim executive director of curriculum and instruction, admitted, "Honestly, I don't know the answer to hardly any of your questions." "I don't know the rationale for moving in this direction," Williams added, "other than our new leadership has experience with it and likes the product." "Those are exactly the kinds of concerns I was hearing," the school board member said. In fact, the emails also show that a potential competitor got wind that Performance Matters was in the building and wanted to know whether her company would have a chance to vie for the district's business. "I expect an RFP process and an opportunity for vendors to have the same opportunity," Changas emailed. "What I have seen time and again with this administration is that our employees are trying to do the right thing, but the administration has shown that they have been willing to skirt the rules, to violate the policy in some instances," Frogge said. "And they are hiding information about spending." Instead, Joseph's team convinced the school board to give Performance Matters what turned out to be a million-dollar, no-bid contract -- without waiting for the results of a pilot program and without giving any other company a chance to compete. Joseph and his team defended the no-bid contract, saying they engaged in a practice called "piggybacking" -- in this case, duplicating a Performance Matters contract with Orange County Public Schools in Florida, which had been put out for bids. But former Baltimore County Schools superintendent Dallas Dance, who served on Joseph's transition team when he came to Nashville, was sentenced to six months in jail last year for failing to disclose money he took from a vendor. At a recent board meeting, Joseph responded to those concerns, saying: "We have had people across the country do bad things. We have not." Still, in Tennessee, state law only allows local governments to piggyback on contracts that have been put out for bids by other governmental units "of this state." "The way I read the code it does not speak to piggybacking on contracts outside the state," said retired state auditor Dennis Dycus, who headed up the division in the state Comptroller's Offices that watchdogs municipal governments. In its written statement, the district said staff simply misinterpreted the law, insisting they “were acting in good faith and with the full intention of being good steward of taxpayers’ dollars." "It has to be the same contract, there cannot be any changes in that contract," Dycus said. "Being the mindset I have as an auditor, I have to ask the question: why did they change?" he added. "And, as a rule, they change it to benefit somebody -- and I would want to know why." 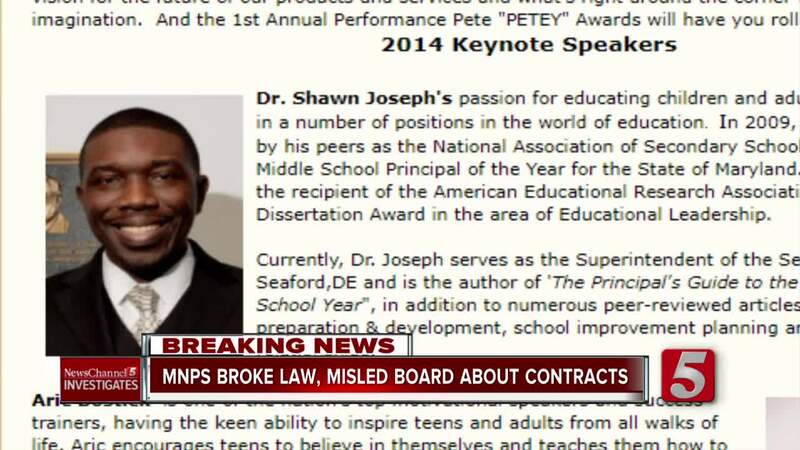 But that wasn't the only contract that Dr. Joseph's team steered to Performance Matters. In 2016, MNPS signed a second contract for $845,651 -- again with no bids -- for the company's TrueNorthLogic platform. That platform is designed to track professional development training for teachers. In the end, Joseph's team decided to go with the higher price. "That's just an absurd jump," Frogge said. "I don't know why we would be paying that much more for the same product." "My understanding is we were at a point where we didn't have time to conduct a normal RFP process," Gossage said. "The only reason that the PM (TrueNorthLogic) PD Management product has been considered and pursued is because … it is immediately available without going through a formal solicitation," Appenfelder wrote in an email to MNPS leadership. "But the immediacy of that need has been removed." "The administration is not being truthful with us, they are just not being truthful," the school board member said. We noted, "It sounds like they didn't want to bid this out." "No," Frogge agreed. "I think that's the consistent theme on this particular contract. They didn't want to bid it. They wanted to rush it through." 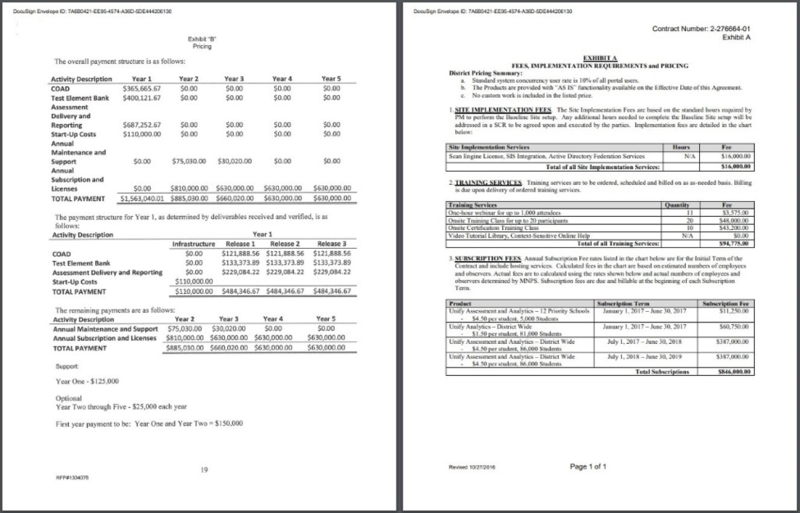 As NewsChannel 5 Investigates previously revealed , the school board approved a two-year, $594,000 contract for the Performance Matters student assessment platform, but Joseph's team signed a three-year, $1 million contract. At the June 2018 meeting, Joseph told the school board that the former purchasing director, Gary Appenfelder, went off on his own and negotiated new terms -- to get a better price --without even telling his boss, chief operating officer Chris Henson. "He was able to re-negotiate a cheaper rate than what the board originally approved. It did extend the contract, but because it was a cheaper contract, he went ahead and did it. He did it without consulting with me,” Joseph said. Turning to Henson, the director of schools continued: “I'm not sure if he spoke with you. I believe he had not consulted with you on the issue, but he was looking for the best interest of the district to get a cheaper rate and went ahead and did that." "Dec 31 is the end of the PM fiscal year," Appenfelder emailed. "Their primary objective is to have executed contracts in hand before the end of the FY. This is doable." Then, in June 2018, Joseph's team brought forward a last-minute request for the school board to approve the third year of those two Performance Matters contracts, warning of dire consequences for teacher training if the deals were not approved. Still, they promised the professional development contract would soon be put out for bids -- to let other companies compete -- if the school board approved the yearlong extension. "It is for 12 months," Gossage told the board. "The plan is -- internally, we've had a discussion about that -- is doing an RFP during that time." The head of research, Paul Changas, told the board, "We would probably have to have that RFP out sometime this fall." "Maybe sooner," Gossage quickly added. Now, seven months later, NewsChannel 5 Investigates has learned that Joseph's team never followed through on that promise either -- and the district has no plan to give any other company a chance to compete for the contract to track professional development for teachers. "Again, the board is not being told the truth on a lot of issues -- and this seems to be some sort of coverup," she explained. “In 2016, a transition team made up of local, state and national experts shared that Nashville needed to focus on student achievement -- with a sense of urgency. MNPS did not have a user-friendly platform for student assessment and professional development. Performance Matters was the right product at the right time. UPDATE: An earlier version of this story stated that Performance Matters was sold to PeopleAdmin in January 2017. That announcement was made in January 2018.